The Harmony Adapter was easily the most sensitive of the adapters we tested when it came to infrared performance, seemingly able to receive commands no matter where the remote control was aimed. This could be at least partly due to the case design, which is completely IR transparent on the front, sides and top. If you have an RF-enabled Harmony with an RF Wireless Extender, you can optionally hook the adapter directly to one of the extender’s infrared output ports using a cable with a 3.5mm headphone-style jack on one end and a 2.5mm jack on the other. Such a cable is not included, and doesn’t seem to be available direct from Logitech. Codes – the odd man out. Logitech’s positioning of the adapter in the Harmony lineup is more than just smart marketing, it’s also meant to convey that it’s intended first and foremost for Harmony remote owners. Now there’s nothing outright about the adapter that would prevent it from working with other brands of universal remote controls, but Logitech would of course prefer that you use a Harmony. To that end, Logitech does not support any way of integrating the adapter with remotes other than the Harmony. Unlike the other products in our roundup that use the standard Sony DVD plus PS2 extensions codeset for maximum compatibility with the widest range of controls, Logitech has employed a completely custom codeset that is very unlikely to be available on any preprogrammed remotes, and does not publish these codes in any official capacity. If you have a learning remote – well, there’s simply nothing to learn from. In the end, using a dedicated codeset for a mass-market product is a wise move, as there are loads of Sony DVD players out there and Logitech wouldn’t want their device to have potential conflicts with them. Of course these custom codes can be obtained from any Harmony remote with the right PS3 configuration; in fact we’ve already done that for you. So as long as you’re using a computer programmable remote control that can accept Pronto hex code format, then the adapter will work fine. However, codes aren’t the only place where the adapter has been geared to Harmony owners. 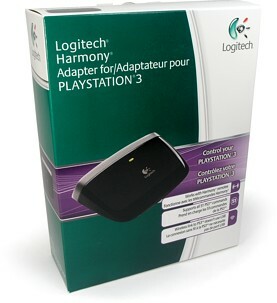 Unlike other units, the Harmony Adapter does not include power state tracking of the PS3 – either variable or hardware based. This particular omission makes at least partial sense, since Harmony remotes already do onboard variable-based tracking of devices. For owners of other remotes, the lack of onboard tracking may make it difficult to create reliable power on and off macros for the PlayStation 3, since the console has a tendency to be easy to turn on but more difficult to shut off. And yet I’m sure that Harmony owners would have still appreciated true hardware-based monitoring, instead of dealing with a variable-based system that can become out-of-sync. Coming from the largest manufacturer in our roundup, the Harmony Adapter for PlayStation 3 naturally has a full website and support forum. It is also backed by a 1 year warranty.